Date: 28th - 30th March 2007. 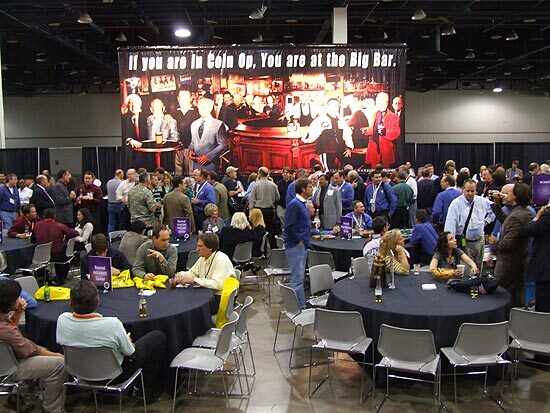 Location: Las Vegas Convention Center, Las Vegas, NV, USA. 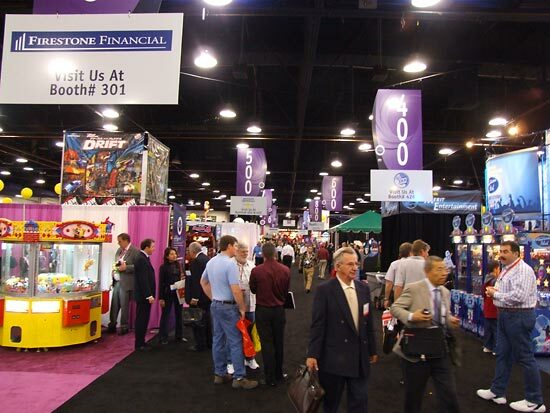 The ASI is the annual showcase for amusement machines for the US market. 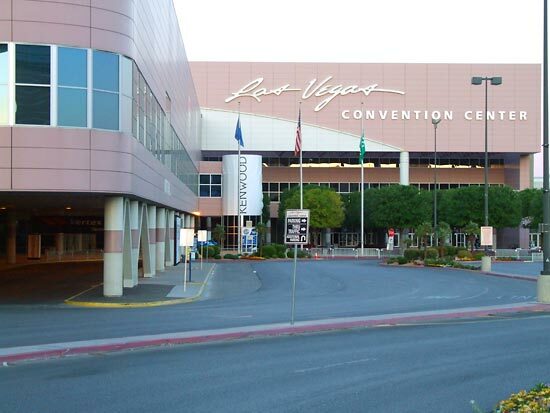 Held in Halls C1 & C2 of the Las Vegas Convention Center, it differs from several of the equivalent European shows by only including amusement machines and eschewing gaming devices such as slot machines and video poker games. Consequently, it is somewhat smaller in floor space than IMA and about a quarter the size of ATEI. 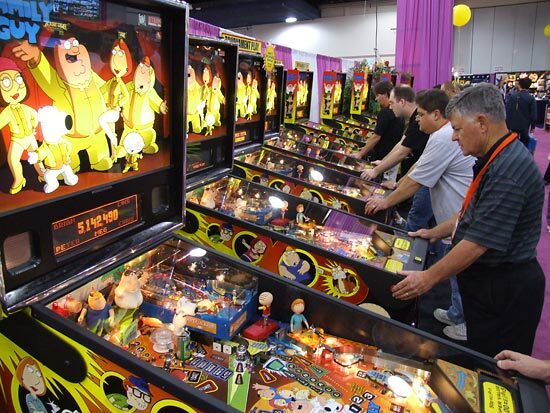 But that lack of gaming equipment provides more space for companies such as Stern Pinball who occupied a large enough area to set up 10 Family Guy games, two Simpsons Kooky Carnival redemption games and have a small meeting area. 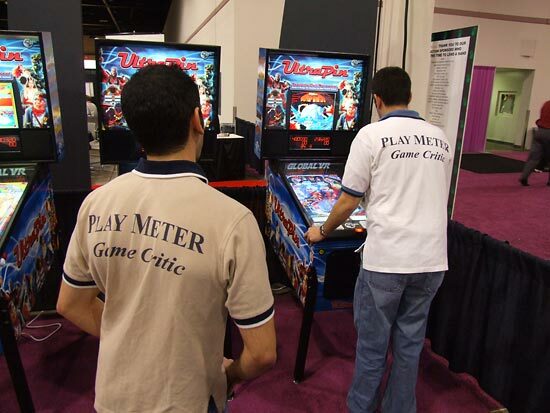 There was a steady flow of players keen to get their hands on the Family Guy machines making it tricky to get a game at times but by and large they held up well with only a couple of minor problems after two days of action. 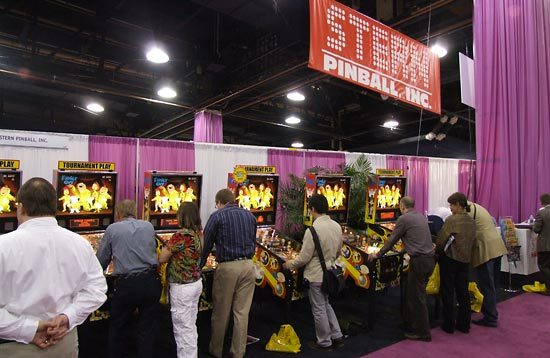 Across the aisle from Stern was the stand of Raw Thrills - the company run by game designer and former Williams pinball programmer Eugene Jarvis. 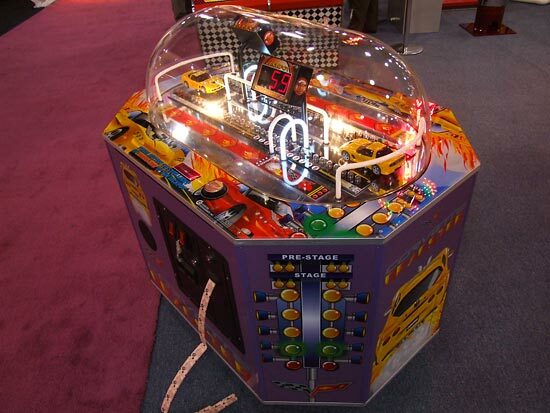 Here's a quick quiz question: Which pinball designer also designed this race car redemption game at the show (shown below)? The answer is at the end of this article. The show ran for three days from 10am Wednesday 28th March, finishing at 5pm each day for the first two days and 4pm on Friday. 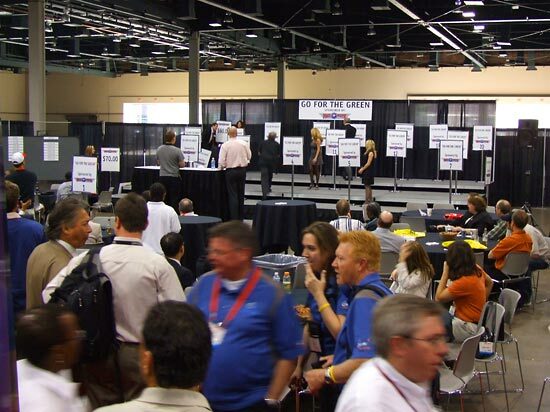 There was a meeting area in a second hall at the back of the main hall and at the close of the show for the first two days, there was a bar set up and some entertainment in the form of several rounds of a "Deal Or No Deal"-style game with attendees as the contestants winning cash prizes. It was in this rear hall that the IFPA were running the pinball tournaments. There were three tournaments running - the Open Division, the Industry Division and the UltraPin Tournament. The Open Division had an initial cash prize of $500 for the winner, $250 for second place and $100 for third but due to the number of entries, those prizes were subsequently increased to $600 , $300 and $150, with a fourth prize introduced of $75. The Industry Division was effectively the B Division and was for those in the amusement industry as opposed to the top A division players. The winner and runners up would receive a plaque. 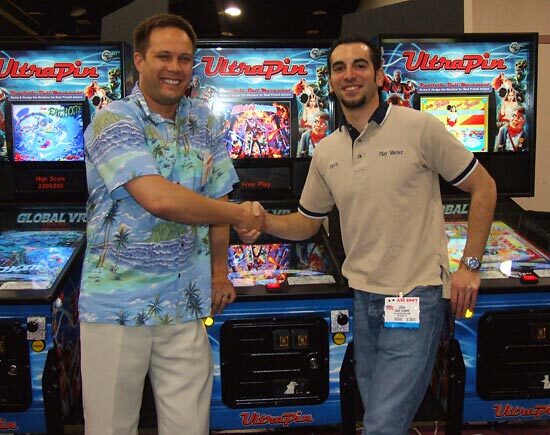 But the biggest prize, though, went to the winner of the UltraPin Tournament played out on five of Global VR's video pinball machines, each running a different table. The champion here would receive an UltraPin machine valued at over $6000. All three tournaments worked in the same way. Players paid $10 for three plays on any of the games in their division. 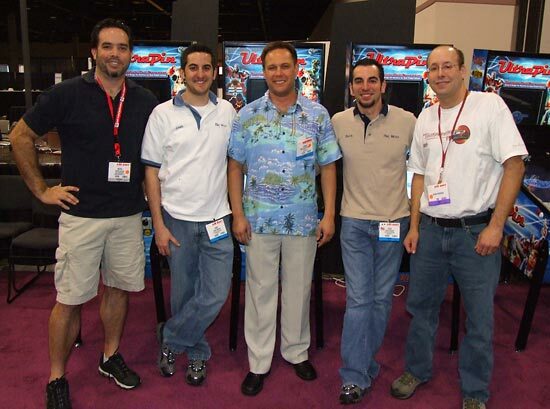 The Open division and the Industry division both played on five games - Family Guy, Whirlwind, Galaxy, Domino and Aladdin's Castle. A player's scores were ranked against other player's scores and a top ten list of players for each game was produced and posted on the notice board throughout the day. When qualifying closed, the top player received 10 points, the second got 9 points and so on. The players' total points from all games were then summed to give a list of the top scorers. The top 7 players then went into the final rounds. The top qualifier got a bye for the first round where it was single elimination, best-of-three-games for the remaining six players, to reduce the number to the last 4 and then to the final 2. The same system was used for the UltraPin Tournament where the chosen games were Medieval Madness, Strikes & Spares, Fathom, Eight Ball Champ and Firepower. The Industry division and UltraPin division final rounds took place first during the wind-down period on Thursday afternoon in front of a large audience. 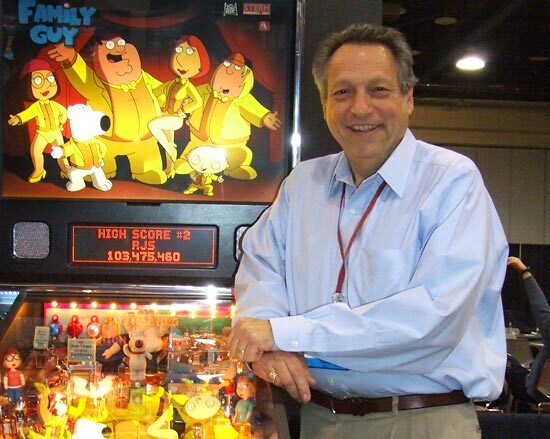 Before play began, though, there was a presentation to Keith Elwin to mark his winning of the IFPA's World's Greatest Pinball Player for 2006. 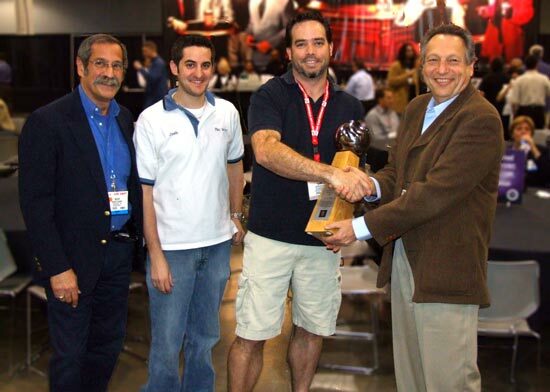 After the presentation, the Industry Division final rounds began which led to the final four being; Carlos Echaves, Steve Epstein, Jamie Beth Einsohn and Roger Sharpe. Roger and Steve won out to make it into the final with Carlos and Jamie playing for third place. Steve triumphed in the final to take first place, Roger was second, Jamie took third place and Carlos was fourth. The UltraPin Division then held its final with the four semi-finalists being Keith Elwin, Josh Sharpe, Zach Sharpe and Jason Werdrick. In the semi-finals, Zach beat Jason and Josh beat Keith leaving the two Sharpe brothers competing in the final. In a tense final it was Zach who won the first two games and took first place, winning the UltraPin game. Josh was second and in a play-off it was Jason who achieved third place with Keith fourth. 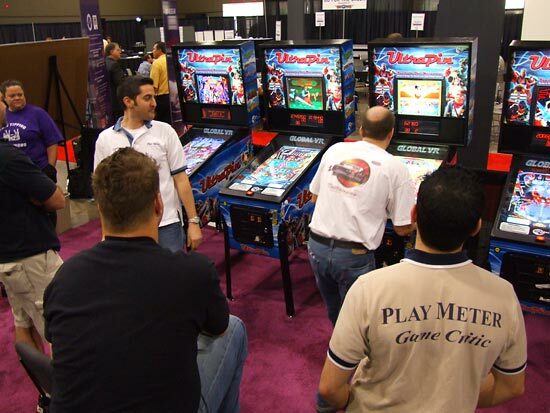 The Open Division finals took place on Friday when, sadly, we were flying on our way to the Chicagoland Show but John Kosmal took first place and the $500 top prize making it a profitable week for him following his Texas Pinball Festival win five days earlier. Second place went to Bowen Kerins, third was Keith Elwin and fourth was Neil Shatz. 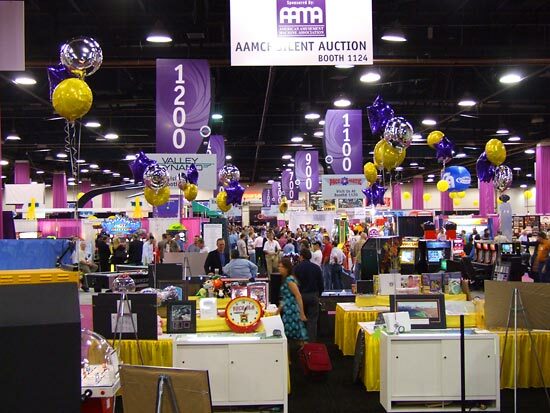 The ASI show was enjoyable and the Stern and Golbal VR games provided good entertainment but the remainder of the show provided little in terms of innovative ideas or product development. 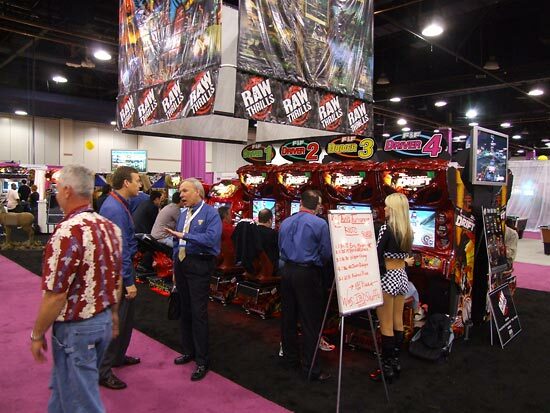 The three tournaments greatly enhanced the ASI show for pinball players and promoted the game in front of a large audience of industry staff and game buyers. 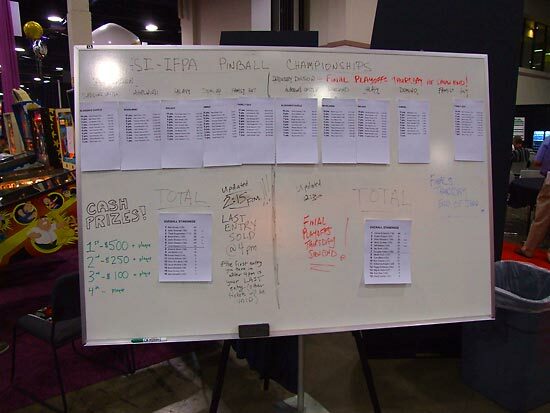 With almost 80 contestants taking part playing 315 entries between them, it hopefully demonstrated to the rest of the amusement industry how pinball is still a lively and vibrant sport with a dedicated fanbase providing strong support for those operators who site and maintain games on location. 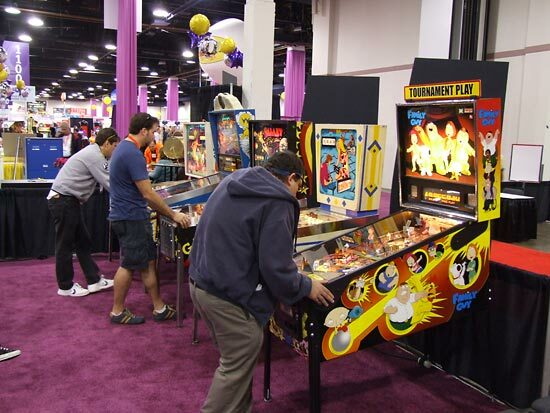 You've read about the show but now you can see it for yourself with our exclusive Pinball News Four Minute Tour. Simply click on the play button below and take a walk around the show. Quiz question answer: The race car redemption game was designed by Steve Ritchie.